What could be cuter than a little robot that scuttles around its playpen and smiles all day? For the 2018 Hackaday prize [bobricius] is sharing his 2D Actuator for Micro Magnetic Robot. The name is not so cute, but it boasts a bill of materials under ten USD, so it should be perfect for educational use, which is why it is being created. The double-layer circuit board hides six poles. Three poles run vertically, and three of them run horizontally. Each pole is analogous to a winding in a stepper motor. As the poles turn on, the magnetic shuttle moves to the nearest active pole. When the perpendicular windings activate, it becomes possible to lock that shuttle in place. As the windings activate in sequence, it becomes possible to move left/right and forward/back. The second video demonstrates this perfectly. [bobricius] found inspiration from a scarier source, but wants us to know this is his creation, not a patent infringement. We are not lawyers. Our society needs energy, and lots of it. If you’re reading this then the odds are astronomically good that you’re on a computer somewhere using energy, with the power cord plugged into the mysterious “black box” that is the electrical grid. The same is true if you’re reading this on a laptop or phone, which was charged from said black box even though it may not be connected at this moment. No matter where you are, you’re connected to some sort of energy source almost all the time. For almost every one of us, we have power lines leading up to our homes, which presumably connect to a power plant somewhere. This network of power lines, substations, even more power lines, and power plants is colloquially known as the electrical grid which we will be exploring in a series of articles. While the electrical grid is a little over a century old, humanity has been using various energy sources since the agricultural revolution at least. While it started with animal fat for candles, wind for milling grain, and forests for building civilizations, it moved on to coal and steam during the industrial revolution and has ended up in a huge interconnected network of power lines connected to nuclear, natural gas, coal, solar, and wind sites around the world. Regardless of the energy source, though, there’s one reason that we settled on using electricity as the medium for transporting energy: it’s the easiest way we’ve found to move it from place to place. Keeping track your overall electricity usage is a good thing, and it’s even better if you know where all the kilowatt-hours are going. [Anurag Chugh’s] house has the three phases coming from the electrical distribution box tidily organized: One for the lighting and fans, one for household appliances, and one for the hot water supply. To monitor and analyze the electrical fingerprint of his house, [Anurag] installed a 3 phase energy meter and hooked it up to the internet. [Jean-Noel] is fixing a broken Lurem woodworking machine. This machine uses a three-phase Dahlander motor, which has three operation modes: stop, half speed, and full speed. The motor uses a special mechanical switch to select the operating mode. Unfortunately, the mechanical bits inside the switch were broken, and the motor couldn’t be turned on. To solve the problem without sourcing a new switch, [Jean-Noel] built his own Arduino based Dahlander switch. 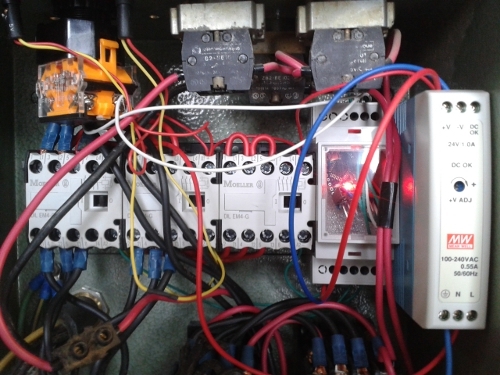 This consists of three relays that select the wiring configuration for each speed mode. There’s also a button to toggle settings, and two lamps to show what mode the motor is currently in. The Arduino runs a finite-state machine (FSM), ensuring that the device transitions through the modes in the correct order. This is quite important, since the motor could be damaged if certain restrictions aren’t followed. The state machine graph was generated using Fizzim, a free tool that generates not only FSM graphs, but also Verilog and VHDL code for the machines. The final product is housed in a DIN rail case, which allows it to be securely mounted along with the rest of the wiring. The detailed write-up on this project explains all the details of the motor, and the challenges of building this replacement switch. Here are the power and driver boards that [Miceuz] designed to control a three-phase induction motor. This is his first time building such a setup and he learned a lot along the way. He admits it’s not an industrial quality driver, but it will work for motors that need 200 watts or less of power. The motor control board uses an MC3PHAC driver IC and an IRAMS06UP60A handles the power side of things. The majority of the board design came from studying the recommended application schematics for these two parts. But that’s far from all that goes into the setup. Motor drivers always include levels of protection (the whole reason to have a driver in the first place) and that comes in several different forms. [Miceuz] made sure to add EMI, over voltage, and over current protection. He discusses all of these, sharing links that explain the concepts of each. Two sparks are better than one, a sentiment that was never more blindingly illustrated than with this three-conductor Jacob’s Ladder. The build centers around three-phase power, which uses a trio of alternating current sources sharing the same frequency, but offset by 1/3 from one another. 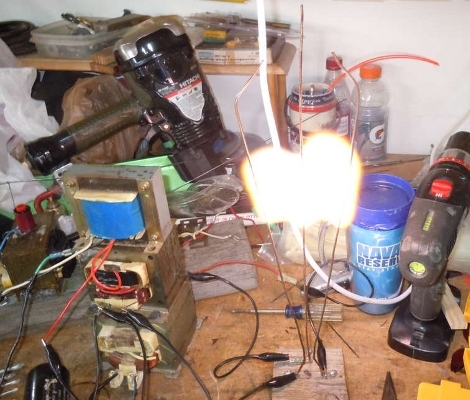 If we’re reading the schematic correctly, [Jimmy Proton] is using normal mains as a power source, then connecting three transformers and a capacitor to set up the different phases. Two of the transformers, which were pulled from microwave ovens, are wired in antiparallel, with their cores connected to each other. The third transform is connected in series on one leg of the circuit. The video after the break starts with the satisfying hum of power, only to be outdone by the wild sparks that traverse the air gap between conductors of the ladder. After seeing the first demonstration we kind of expected something to start on fire but it looks like all is well. We’ll probably stick to a less complicated version of Jacob’s Ladder.